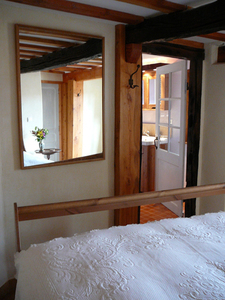 The gite is perfectly located for excursions to the sea, the mountains, cathar castles and markets. And only 7 kms away from the small towns of Esperaza and Quillan. It is 45 minutes from Carcassonne and the owners are on hand to help with holiday plans. Not far from Quillan a cross roads of the Pyrennees, there are numerous down hill and cross country ski centres where Toulousains spend their holidays locals go for day trips. In winter many locals also take off for a day of down hill and cross country skiing and snow boarding on the nearby slopes. The house serves as a good base when some members of the family or group are not that keen on skiing and would prefer to hike. It is also well located as a base while searching for a home in the Languedoc. Its well equipped and homey atmosphere and broadband and optional telephone facilities make it a perfect choice for those wishing to use is for a sabbatical vacation. All bedrooms have wooden floors with wool or cotton rugs. The owners live nearby and are available if needed. All around the area are castles, mountain forests, valleys and garrigue, historic abbeys, romanesque churches, gorges, grottoes and spas. Many of the most famous Cathar sites are only a short drive or cycle ride away. It is less than a two hour's walk away to the hilltop village of Rennes-le-Château, the site of continuing mysteries surrounding the discovery of vast treasures by the local priest over a century ago. (There are local bookshops in the area entirely dedicated the Cathars, local Templars and the Rennes-le-Chateau mystery.) The area is also a delight for those seeking sport and actvity holidays. Cycling, the French national sport, is the most popular. You can hire mountain bikes ("VTTs") from nearby Esperaza. There are many horse riding treks on offer, hang-gliding, white-water rafting, kayaking and canoeing, mountain climbing, fishing and walking…even hot air ballooning. In the winter the Pyreneen slopes are not far a way and many locals take day trips to ski or snowboard. There are two thermal spring swimming pools nearby and several landscaped lakes open to the public. At the local markets you can sample Spanish delicacies as well as the many local ones, many of them organic: bread, dairy products, honey, vegetables and wild mushrooms. Local wildlife is also an attraction for many visitors. Because of its varied terrain, the Aude possesses more than twice the number of plant species than the whole of the UK, including some 80 types of orchid. It is similarly rich in animal species, particularly birds. main arterial road, the D118, passes 7 kms from the village giving rapid access to many local places of interest. The gîte is 7km from Espéraza to the west, 5 km from Quillan to the south, and 15 km from Limoux to the north. It lies due south of the medieval cité of Carcassonne, less than 30 kilometres from the Mediterranean coast, Spain, Andorra and the Pyrenees. It is ideally placed to visit famous Cathar Castles, including Montsegur, Cabardes, Puivert, Peyreperteuse, Puilaurens, Usson, Aguila, and Queribus. St-Ferriol is 70 kilometres North West of Perpignan, on the coast near the Spanish border. Ryanair flies daily from Stansted (Near London in the UK) to Perpignan, offering cheap flights mid week during the low season. Cars can be hired at the airport. By Road from Perpignan, take the D117 west to Quillan, then take the D118 northwards and turn right to St-Ferriol just as you leave Quillan. Toulouse. St-Ferriol is about an hour and a half's drive from Toulouse, which has an international airport served by British Airways from London Heathrow, Air France from London Gatwick, and Buzz (cheap mid-week flights) from London Stansted. From Toulouse head towards Carcassonne (by car, rail or coach) and then continue as above.